Alfred A. Knopf Books for Young Readers, 9780375867101, 24pp. Do animals celebrate Valentine's Day? Nobody knows for sure. But this funny (and punny) little book imagines how some of them declare their love, affection, or friendship any day of the year. "Nice to Meetcha You smell delish /Wanna share my water dish?" So asks one tail-thumping dog to another. Whereas a courting dolphin sings, "Come, leap with me and be my wife./You're the porpoise of my life." 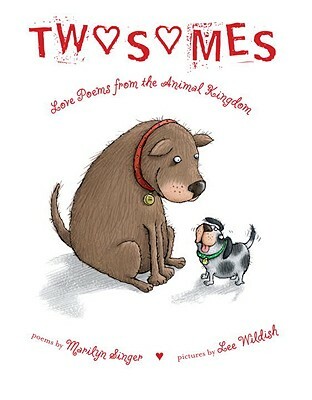 Ranging from dogs and cats and other pets to some you wouldn't want to pet, such as sharks and porcupines, acclaimed poet Marilyn Singer's captivating couplets and Lee Wildish's expressively humorous illustrations provide a Valentine's Day gift for kids who wouldn't be caught dead being lovey-dovey. MARILYN SINGER is well-known for her many poetry books as well as picture books and YA anthologies. She is th co-host of the "Poetry Blast" at the annual American Library Association conference. LEE WILDISH has illustrated a number of children's books in various styles, most recently "Thomas and the Dragon Queen" by Shutta Crum.